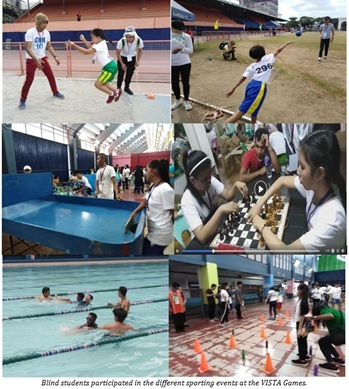 Around 300 blind and visually impaired student-athletes from 43 elementary, Special Education and high schools from the National Capital Region, Regions 1, 2, 3, and 4-A participated in the 11th Visually Impaired Sports and Training Advocacy (VISTA) Games recently held at the Marikina Sports Center. It was organized by Parent Advocates of Visually Impaired Children (PAVIC) as an avenue where these children are honed of their sports prowess, build sportsmanship and camaraderie among and between themselves. These children competed in various sports events that include track and field, swimming, adaptive table tennis, chess, goalball, and other fun games. The games were officiated in by technical officials from the Polytechnic University of the Philippines College of Human Kinetics. 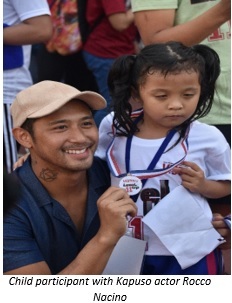 Kapuso actor Rocco Nacino supported the sports event. Also present during the event were Mr. Ruben Torres, President of PAVIC, Mr. Gil Flores, Head of Marikina Persons with Disability Affairs Office, Police Director Eliseo Dela Paz (Ret. ), Chairman of 2019 VISTA Games, Ms. Kathy Diza of the Department of Education, and Ms. Maripres Pascua, Dean of Polytechnic University of the Philippines (PUP)-College of Human Kinetics.